A new film series brought to you by Zia Records! Featuring your cult favorites on the big screen with discounted tickets for Zia Z-Card holders (at the door or in-store at Zia) and giveaways from your favorite local source for entertainment and more; Zia Records! A petite New Jersey housewife finds self-fulfillment through amnesia in this new wave comedy of errors set in New York's hip '80s downtown scene. Rosanna Arquette stars as Roberta, who turns to the personals for vicarious thrills after her four-year marriage to staid hot tub salesman Gary (Mark Blum) grows stale. Her favorite classified ads trace the romance of Jim (Robert Joy), a struggling musician, and Susan (Madonna), a SoHo vamp who's just narrowly escaped being murdered alongside one of her other boyfriends -- a gangster who recently stole some Egyptian jewelry. Through a series of complicated missteps, Roberta ends up losing her memory and convincing both herself and a broodingly handsome young man named Dez (Aiden Quinn) that she's the elusive, adventurous Susan. Soon, Roberta finds herself being romanced by Dez and pursued separately by her husband, Jim, Susan, and by a murderous mobster who's looking for the stolen jewels. 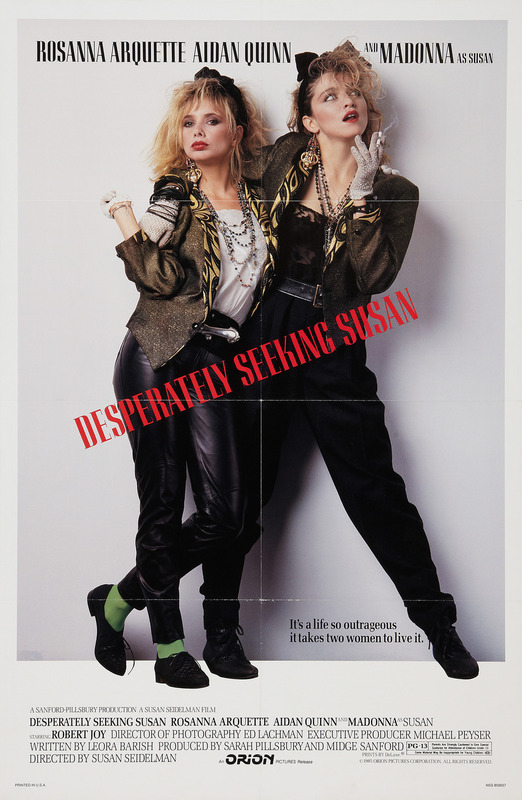 For her second feature outing, which was partially inspired by Jacques Rivette's Celine and Julie Go Boating, director Susan Seidelman filled her cast with hipster extras, downtown personalities, and New York thespians. Notable faces include comedian Steven Wright; future indie mainstay John Turturro; future TV stars Michael Badalucco and Laurie Metcalf; punk singer Richard Hell, who also starred in Seidelman's Smithereens; and performance artist Ann Magnunson, who would star in the director's Making Mr. Right. The big dance-club sequence was filmed at Danceteria, the disco that helped launch Madonna's career. The scene, and the film, helped propel "Into the Groove," one of the singer's all-time club classics, into the charts even though it was actually a b-side to the single "Angel."